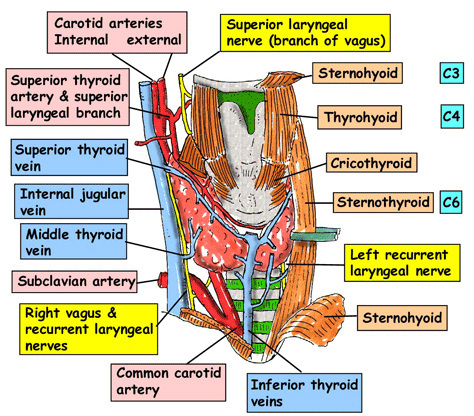 The thyroid gland consists of right and left lobes anterior and lateral to the larynx (voice box) and trachea (windpipe). Each lobe is pear shaped, with its apex directed upward to the level of the oblique line of the thyroid cartilage and its base lying below at the level of the fourth or fifth tracheal ring. Each lobe is approximately 5cm long, with the posteromedial aspect attached to the side of the cricoid cartilage by a lateral thyroid ligament. A third thin lobe called the isthmus connects the lower parts of the two lobes and occasionally may be absent. It measures 1.25cm transversely and vertically and it is usually anterior to the second and third tracheal (windpipe) ring, sometimes higher or lower because its size and site is variable. A pyramidal lobe may be present and it projects towards the hyoid bone from the isthmus or the adjacent parts of either lobe, usually the left. A fibrous or fibromuscular band, the levator of the thyroid gland, sometimes descends from the body of the hyoid to the isthmus or pyramidal lobe. The thyroid gland is surrounded by a thin fibrous capsule, which sends septa deeply into the gland. The thyroid gland lies in front of the neck, hidden by the anterior muscles of the neck, sternothyroid and sternohyoid muscles. It usually weighs 25g but this varies, as the gland is slightly heavier in females, and enlarges during menstruation and pregnancy. Estimation of the size of the thyroid gland by diagnostic ultrasound is important clinically, so as to evaluate and manage thyroid disorders. The anterior border of the gland is thin, the posterior border is rounded and related inferiorly to the inferior thyroid artery. The lateral surface is covered by the sternothyroid muscle, which is attached to the oblique line of the thyroid cartilage preventing the upper pole of the gland from extending onto the thyrohyoid muscle. Anteriorly: Pretracheal fascia, sternohyoid muscle and the superior belly of omohyoid muscle. Overlapped inferiorly by the anterior border of the sternocleidomastoid muscle. 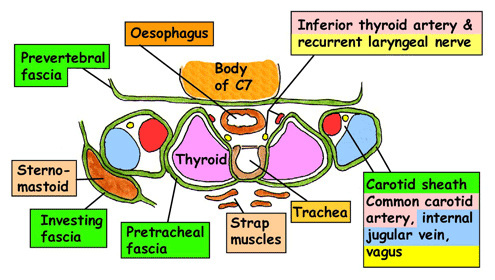 gland contacts the inferior pharyngeal constrictor and superior part of cricothyroid. The external laryngeal nerve runs medial to the superior pole to supply the cricothyroid muscle. Posteriorly: Prevertebral fascia, carotid sheath, parathyroid glands and trachea. The isthmus is covered by sternothyroid and is separated from it by pretreachial fascia. The superior thyroid arteries anastomose along its upper border and the inferior thyroid veins leave the thyroid gland at its lower border.